As u all know am a member of Home baker's Challenge, a group dedicated for baking enthusiastic. The last month challenge was given by Manjula and the challenge was Bread. 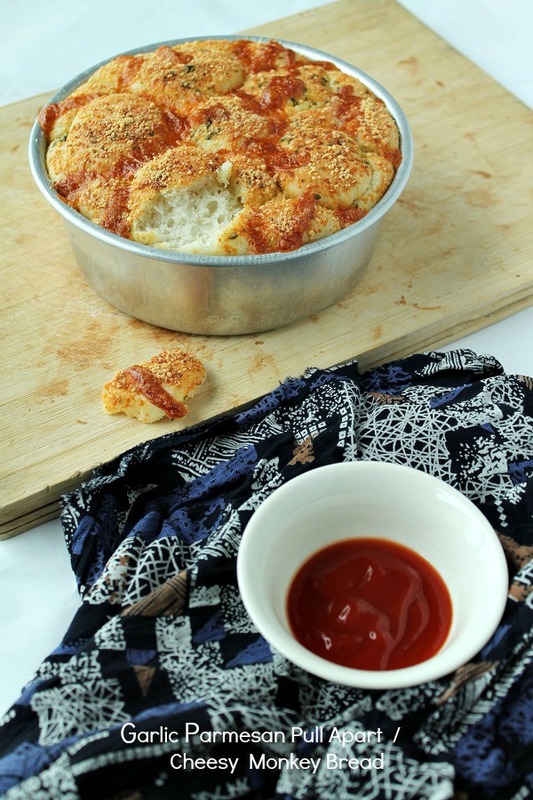 There were 4 wonderful choices given by Manjula, out of all I've selected this Monkey bread and slightly altered the recipe to make it savory as it will be finished soon after baking, there are no takers for sweet bread at home. Thanks Priya n Manjula for giving this amazing challenge, u know what I've this bread twice in 24 hours, yes, am such a big fan of garlic bread. 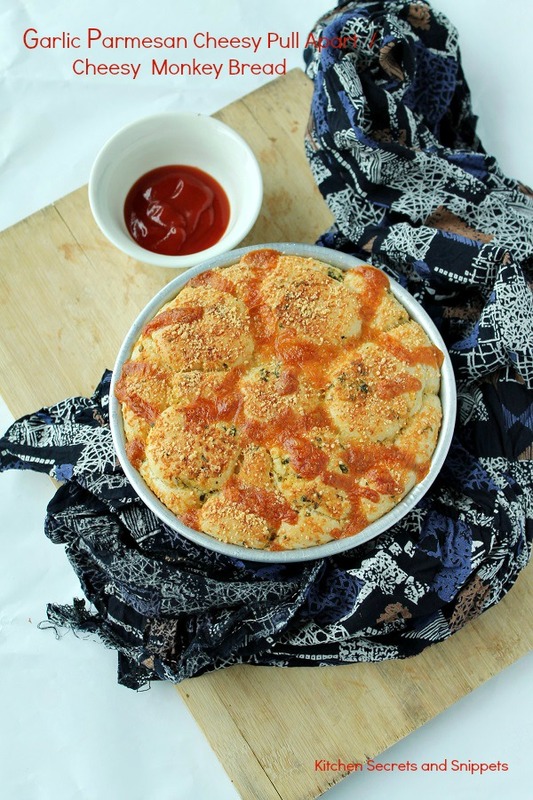 It was so yum that I totally loved doing this challenge. Proof the yeast with 3/4 tsp. sugar and the water mentioned above, mix well and set aside until it foams on the top, say about 5 minutes. 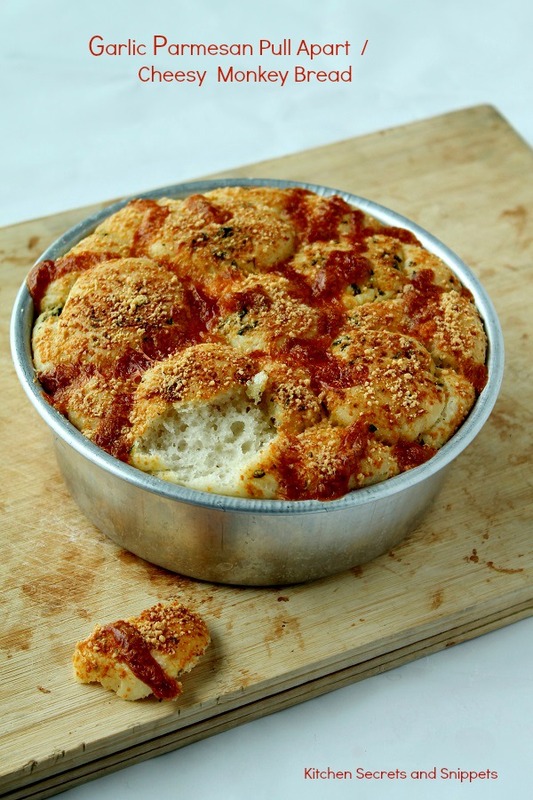 Combine the flour, olive oil, minced garlic and the yeast water in a bowl and form a dough, the dough will be sticky. Grease an another bowl with little bit of oil , transfer the dough to the greased bowl and cover it tightly with cling wrap. Set aside in a warm place for one hour or until the dough doubles in size. 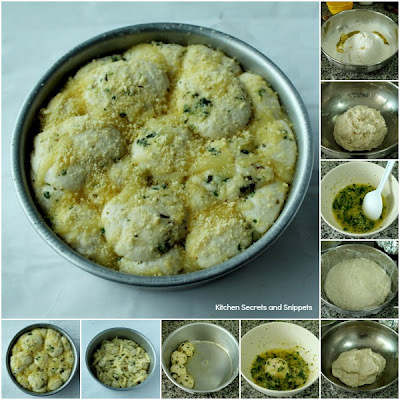 In the meantime, melt the butter and add the minced garlic, salt, dry herbs, coriander leaves, Parmesan cheese and mix well. Set aside. Remove the cling wrap and punch down the dough so that all the air comes out. Grease the baking pan with little olive oil . Now pinch out small balls , which is smaller than a Golf ball size and roll the balls in the butter mixture and line it in the baking pan. Sprinkle the Parmesan cheese and the Mozzarella cheese on top. Cover the baking pan with cling wrap and again proof the dough for an another 30 minutes. Preheat the oven to 175 deg C for 5 minutes. Now, if u see, the dough should have raised to almost double in size. Bake the raised dough to 25 to 30 minutes. Remove the pan from the oven, cool for 5 minutes and then serve warm. U may add the Mozarella cheese in between the balls while stacking in the baking pan, so that it doesn't brown/ broil much while baking. And that is the exact mistake I've done and therefore the cheese on top had turned to brown in colour. Otherwise , u may also add the cheese at the end of the baking time, like a minute or two before the baking ends and bake so that it melts perfectly and yummy. wow delicious looking pull a parts and they look so so soft :) perfectly done !! yum monkey bread Shanavi. love the clicks. What a beautiful and soft texture.. Delicious..
wow... 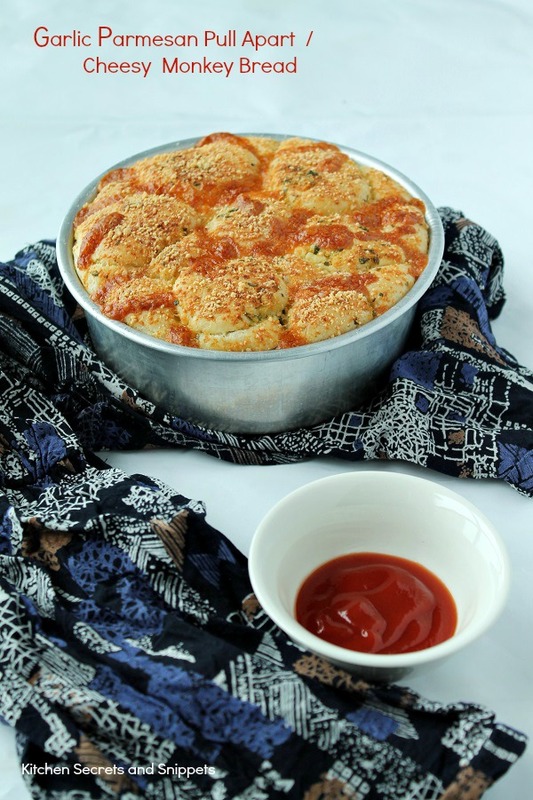 Awesome recipe... Nice clicks..
Omg, this bread is just torturing me, garlic and parmesan thats a makes an incredible combo na, loving this monkey bread. 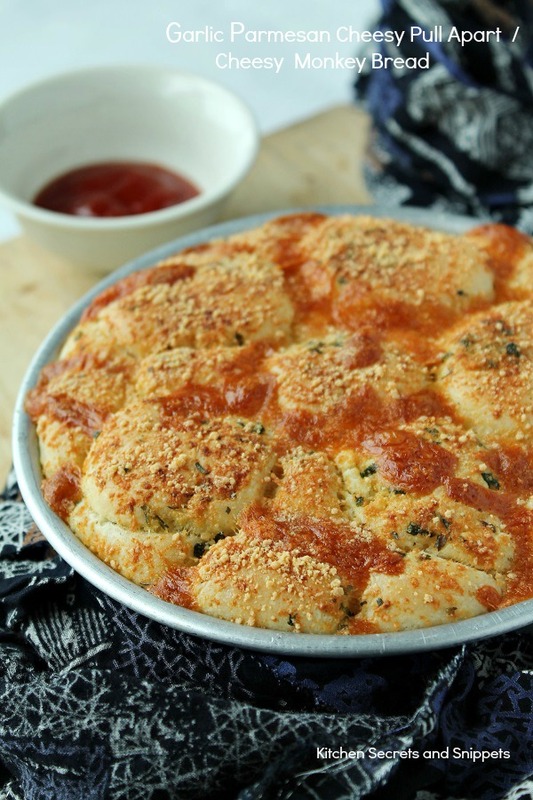 Delicious garlic paramesan pullapart bread. Love the combination of flavors.. Delicious bread.. So attractive bread.loved the stepwise pics.